This show was begun as a part of the Fort Sisseton Historical Festival, by one of their locals there, in South Dakota. This was a one-weekend event in June. The first couple years, the local, who was also an attorney, played the part of Dakota Dan. They got me and one of the popular jugglers, named Fud, from the Minnesota Renaissance Festival. Over a period of several years, we went through several jugglers and I believe four different medicine men. 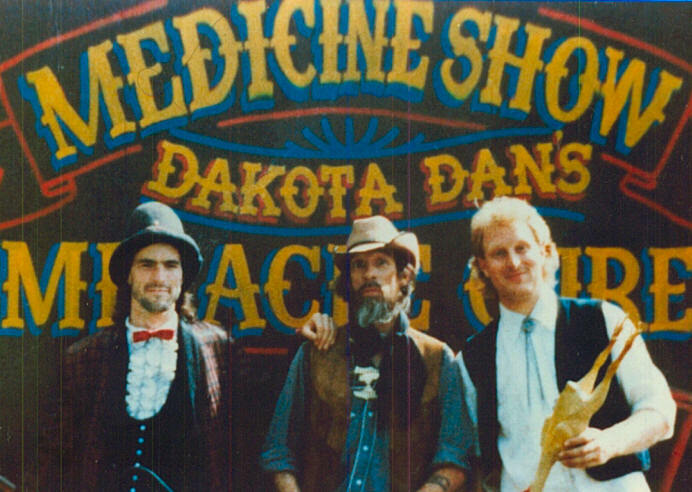 Dakota Dan's Miracle Cure, originally bottled by the staff of Ft. Sisseton, eventually got bottled by us, the core of the show itself. We made some improvements to the labels, including one personalizing them for the event we performed at. This made them a souvenir of the event. Trouble was, a lot of kids bought them and consumed their entire contents -distilled water- on the spot. Discarded bottles, when found, would get returned to our stock, to be washed, refilled, and re-labeled for another show. The basic outline of the show was a big drumming, including an endless drumroll that only stopped when Dan took the drumsticks away from Mephisto. Then the drum itself rolled across the stage, for a REAL drumroll. Some simple stage magic followed, with magic tricks interspersed with comedic sketches of the many uses for Dakota Dan's Miracle Cure. 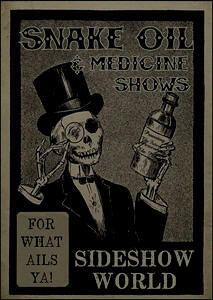 While the juggler worked, Mephisto slipped backstage, to emerge behind the crowds in time for the next act, an honest-to-goodness demonstration of the healing powers of the Miracle Cure. As could be guessed, Mephisto had changed costumes and become the "shill" in the audience. One show he'd be a bearded old man on crutches, another he'd be a "beautiful" woman who unfortunately had a hormone problem and sported a 3-inch beard. After turning the old man upside down in a washpan, and giving him a swig of Dan's Miracle Cure, he'd jump and click his heels, run off through the crowds laughing, only to return to the rear of the show stage. The woman, after explaining her situation, and not being cured of her hersuitism, was informed of a circus across town looking for a bearded woman, so she ran off to begin a new life where everyone loves her... Thanks to the wonderful properties of Dakota Dan's Miracle Cure! Sometimes she'd also want a kiss from the juggler, and chase him offstage and through the crowds. The show carried two trunks, each filled with toys, jokes, gags, and a few musical instruments, so anything could be pulled out at any time, for hilarious impromptu and improv comedy stunts. As a special thank-you gift, audience members asked to step onstage for participation bits would be presented a waxed sandwich bag with a baker's dozen donut plant seeds. Though it began as a part of the Fort Sisseton, SD Historical Society's annual frontier festival, we eventually took it to several county fairs around the Midwest area, and in 1990, I believe, presented it onstage at the Fairs and Festivals convention at the St. Paul Hilton Hotel.